There has been a lot of research on the areas related to smoking and e-cigs. Some of this is unreliable and goes back to the late 1800’s but is still quoted today. Other research is more up to date but some researchers have failed to consider how the devices are used in the real world and so have come up with false (& alarming) conclusions. Fortunately, there are researchers who have both the knowledge of real-world usage and an objective, scientific stance. Research is often presented first at conferences – commonly as an abstract or poster – mainly to facilitate the discussion with peers. Any results presented are often from very early in the research process and haven’t usually gone through peer-review. So it’s important not to confuse ‘conference papers/posters’ with established research. Peer-review, in theory, gives a quality assurance that is necessary for publication in a professional journal. Some of this conference reported research never makes it to full publication. Sometimes this is because what looked like promising results at the start weren’t confirmed later in the study. Sometimes peer reviewers or journal editors just refuse to accept a piece of work. With press reports, conference papers and abstracts, very limited details are usually available on a study’s methods and results. This makes it impossible to properly judge the study’s strengths and limitations. This doesn’t mean that all research presented at conferences is unreliable – just that, where possible, it’s best to reserve judgment until after the research has been published in a peer-reviewed journal. Research can be refused for publication simply because it doesn’t ‘fit’ with the editors chosen themes and, unfortunately, not all peer reviews are as rigorous as they should be. So, it’s possible for a ‘good’ piece of work to never be published and for ‘poor’ work to appear in print. In fact, it is harder to get research with “negative” outcomes published. If the expected and/or wanted effect was not observed, many journals will refuse to publish experimental results. An example might be the testing of vapour that is believed to contain toxins. If the experimental outcome shows no difference between vapour and fresh air, then the result will often end up buried in the laboratory’s archive and never be published. Clearly such a ‘negative’ result is important to the advancement of science but if it is never published, we will not know about it. Unfortunately, there are researchers whose aim is to find problems with e-cigs. If their research finds no problems, they may not submit it for publication at all. Some of the niche journals whose main customers are practitioners with a shared world view may not follow the peer-review process in the same rigorous way that an independent journal would. Another factor to consider when reading a piece of research is that where another paper is referred to, unless it can be accessed, it may not necessarily be ‘strong evidence’ for what is claimed. For example, a piece of research that you are reading states that ‘Jones (2013) argued that passive smoking is dangerous’. How should you interpret this if you can’t access Jones’ paper? The answer is to treat it with extreme caution because it isn’t clear if this was just Jones’ opinion, if it was based on evidence, other peoples work or a conversation he had with someone over a water cooler. All we know is that Jones’ argued this – not whether Jones’ argument was valid. If you want to read more detail, the list of work on electronic cigarettes below from peer-reviewed journals between 2007 – 2013 should not be taken just on face value! However, where the source is available, a brief description of the work is provided. Where the full text is not available but an abstract is viewable online, a link has been provided. E-Cigarettes: Prevalence and Attitudes in Great Britain. Dockrell M, Morison R, Bauld L, McNeill A. Nicotine Tob Res. 2013 May 23.
little evidence of e-cigarette use among adults who had never smoked. The full text is available online. Analysis of refill liquids for electronic cigarettes. Etter JF, Zäther E, Svensson S. Addiction. 2013 May 23. doi: 10.1111/add.12235. 20 models of 10 brands of e-liquids were analysed using gas and liquid chromatography. Only an abstract was available for this paper online. The conclusions were that the nicotine content of the e-liquids tested was close to that stated on their labels. Impurities were detected in several brands above the level set for nicotine products in the European Pharmacopoeia, but below the level where they would be likely to cause harm. Non-Cigarette Tobacco and the Lung. Schivo M, Avdalovic MV, Murin S. Clin Rev Allergy Immunol. 2013 May 15. This appears to be a discussion paper actually focused more on waterpies but seems to concede that ‘…there may be evidence of harm reduction…’ Only an abstract was available. Use of Electronic Cigarettes Among State Tobacco Cessation Quitline Callers.Vickerman KA, Carpenter KM, Altman T, Nash CM, Zbikowski SM. Nicotine Tob Res. 2013 May 8. Whilst the full text of this paper is not available, It’s methods & it’s author’s potential conflict of interests have been raised by Micheal Siegel as problematic: (http://tobaccoanalysis.blogspot.co.uk/2013/05/authors-of-electronic-cigarettequitline.html). The study describes e-cigarette use in a large group of tobacco users seeking treatment. Perceived efficacy of e-cigarettes versus nicotine replacement therapy among successful e-cigarette users: a qualitative approach. Barbeau AM, Burda J, Siegel M. Addict Sci Clin Pract. 2013 Mar 5;8(1):5. doi: 10.1186/1940-0640-8-5. The full text of this paper is available online. It concerns a focus group of 11 self-selecting participants drawn from e-cig forums. The focus group explored users’ experience. Study protocol for a randomised controlled trial of electronic cigarettes versus nicotine patch for smoking cessation. Bullen C, Williman J, Howe C, Laugesen M, McRobbie H, Parag V, Walker N. BMC Public Health. 2013 Mar 8;13:210. doi: 10.1186/1471-2458-13-210. This paper, for which the full text is available online, discusses the design for a study due to be published Sept. 2013. Alternative tobacco product use and smoking cessation: a national study. Popova L, Ling PM. Am J Public Health. 2013 May;103(5):923-30. doi: 10.2105/AJPH.2012.301070. Epub 2013 Mar 14. Levels of selected carcinogens and toxicants in vapour from electronic cigarettes.Goniewicz ML, Knysak J, Gawron M, Kosmider L, Sobczak A, Kurek J, Prokopowicz A, Jablonska-Czapla M, Rosik-Dulewska C, Havel C, Jacob P 3rd, Benowitz N. Tob Control. 2013 Mar 6. Determination of tobacco-specific nitrosamines in replacement liquids of electronic cigarettes by liquid chromatography-tandem mass spectrometry. Kim HJ, Shin HS. J Chromatogr A. 2013 May 24;1291:48-55. doi: 10.1016/j.chroma.2013.03.035. Epub 2013 Mar 26. Only an abstract of this article is available online. The study used liquid chromatography & mass spectrometry techniques to examine 105 e-liquids produced by 11 Korean companies. A key issue with this study is that liquid was studied & different results may have been obtained had the e-liquid first been vaporised. Health-related effects reported by electronic cigarette users in online forums. Hua M, Alfi M, Talbot P. J Med Internet Res. 2013 Apr 8;15(4):e59. doi: 10.2196/jmir.2324. The full text of this article is available online. It is not clear if this was subjected to peer review or merely reviewed by the editor. The method of data gathering does not accord with reasonable ethical standards since participants were not asked for informed consent. The data gathering methods are likely to result in higher negative symptom reports than positive since it is less likely that individuals would report positive results on the health section of a forum. There is insufficient demographic information and no information provided on length of use of electronic cigarettes. There are too many other errors and assumptions in the piece to list. For example, most medical professionals would love to know the signs and symptoms of high blood pressure (there aren’t any – It is necessary to test to establish this.) The level of ‘sight’ related complaints is also remarkable. It must be assumed that these users poked themselves in the eye with the device. ‘Vaping’ profiles and preferences: an online survey of electronic cigarette users.Dawkins L, Turner J, Roberts A, Soar K. Addiction. 2013 Jun;108(6):1115-25. doi: 10.1111/add.12150. Epub 2013 Mar 28. The full text is not available for this paper. It used a cross sectional, self selecting design with participants initially drawn from the forums of two UK manufacturers and a questionnaire was completed online. In contrast to the previous study, very few users reported adverse health effects (<16%) and around 70% (in each case) reported improvement in cough & breathing. Three-quarters of the whole sample said that they had not smoked for several weeks to months since using the e-cigarette. The sample may over-represent people who have found e-cigarettes to be beneficial. Awareness and Ever Use of Electronic Cigarettes Among U.S. Adults, 2010-2011. King BA, Alam S, Promoff G, Arrazola R, Dube SR. Nicotine Tob Res. 2013 Feb 28. Chronic idiopathic neutrophilia in a smoker, relieved after smoking cessation with the use of electronic cigarette: a case report. Farsalinos KE, Romagna G. Clin Med Insights Case Rep. 2013;6:15-21. doi: 10.4137/CCRep.S11175. The full text for this study is online. It reports the case of a single individual who was found to have a high white blood cell count (WBC) at a routine examination but no identifiable disease. He was advised to stop smoking. Two quit attempts were unsuccessful. The first using OTC NRT unassisted and the second using both varenicline and NRT patches. His WBC returned to the normal range after he quit at a third attempt using an electronic cigarette & continued to use it. One case is not that significant and the result could be coincidental but the authors give a good overview of some other research in their discussion and open up an area where further work would be useful. Acute impact of active and passive electronic cigarette smoking on serum cotinine and lung function. Flouris AD, Chorti MS, Poulianiti KP, Jamurtas AZ, Kostikas K, Tzatzarakis MN, Wallace Hayes A, Tsatsaki AM, Koutedakis Y. Inhal Toxicol. 2013 Feb;25(2):91-101. doi: 10.3109/08958378.2012.758197. Only an abstract is available online. This study followed 15 smokers & 15 non-smokers in a repeated-measures controlled study & assessed serum cotinine, lung function, exhaled carbon monoxide and nitric oxide levels. The study found that e-cigarettes had no significant impact on lung function (LF). Tobacco had a negative LF effect as would be expected. Similar nicotine levels to tobacco use were found with e-cigarettes. This is a very small scale study over a short time period but it is a positive step in demonstrating the respiratory safety of these products in the short term. Electronic cigarettes: a new nicotine gateway? Grana RA. J Adolesc Health. 2013 Feb;52(2):135-6. doi: 10.1016/j.jadohealth.2012.11.007. The full text is available online. This is an editorial by a tobacco control author which refers to Pepper JK, Reiter PL, McRee A-L, Cameron LD, Gilkey MB, Brewer NT. Adolescent males’ awareness of and willingness to try electronic cigarettes. J Adolesc Health 2013;52:144–50 in the same journal issue. The author uses it to argue that because adolescents are more aware of e-cigarettes than adults, they are likely to be a gateway product. She also cites FDA research & other work by tobacco control advocates in claiming the product is dangerous. Characteristics associated with awareness, perceptions, and use of electronic nicotine delivery systems among young US Midwestern adults. Choi K, Forster J. Am J Public Health. 2013 Mar;103(3):556-61. doi: 10.2105/AJPH.2012.300947. Abstract only available online. This questionnaire based study included 2624 US Midwestern adults aged 20 to 28 years and sought to assess awareness and use of e-cigarettes, perceptions of them as a smoking cessation aid, and beliefs about their harmfulness and addictiveness relative to cigarettes. It also gathered demographic data & smoking status. The results found that 69.9% were aware of e-cigarettes, 7.0% had ever used e-cigarettes. Of those who were aware of e-cigarettes, 44.5% agreed e-cigarettes could help people quit smoking & 52.8% agreed e-cigarettes were less harmful than tobacco cigarettes. Electronic cigarette aerosol particle size distribution measurements. Ingebrethsen BJ, Cole SK, Alderman SL. Inhal Toxicol. 2012 Dec;24(14):976-84. doi: 10.3109/08958378.2012.744781. Abstract only available online. The study examined particle size of e-cigarette aerosols. It found e-cig vapour to have particle diameters of average mass in the 250-450 nm range and particle number concentrations in the 10(9) particles/cm(3) range. This is comparable to figures observed for tobacco burning cigarette smoke in prior studies. ..”. Without sight of the full text it is impossible to comment further on this study. Electronic nicotine delivery systems: regulatory and safety challenges: Singapore perspective. Cheah NP, Chong NW, Tan J, Morsed FA, Yee SK. Tob Control. 2012 Dec 1. Abstract only available online. The study used gas chromatography/Mass spectrometry to investigate an unspecified number of ‘cartidges’: “…for design features, including nicotine and glycols content… The results show[ed] poor consistency between actual nicotine content analysed on ENDS cartridges and the amount labelled..”. Without sight of the full text it is impossible to comment on this study. Time for NHS policy on electronic cigarettes. Bains M, Agombar H, Clarke E, Patel R. BMJ. 2012 Oct 17;345:e6587. doi: 10.1136/bmj.e6587. In vitro particle size distributions in electronic and conventional cigarette aerosols suggest comparable deposition patterns. Zhang Y, Sumner W, Chen DR. Nicotine Tob Res. 2013 Feb;15(2):501-8. doi: 10.1093/ntr/nts165. Abstract only available online. The study investigated particle size in vapour from electrionic cigarettes and found that: “… Nicotine delivery may depend on vaping technique, particle evolution, and cloud effects. Predicted 10% arterial and 15% venous delivery may describe bystander exposure better than vapers exposure…” Without sight of the full text it is impossible to comment on this study. Comparison of the effects of e-cigarette vapor and cigarette smoke on indoor air quality. McAuley TR, Hopke PK, Zhao J, Babaian S. Inhal Toxicol. 2012 Oct;24(12):850-7. doi: 10.3109/08958378.2012.724728. Abstract only available online. For all by-products measured, 4 ‘high strength’ electronic cigarettes produced very small exposures relative to tobacco cigarettes. The study indicated no apparent risk to human health from e-cigarette emissions based on the compounds analyzed. Without sight of the full text it is impossible to comment further on this study. Electronic cigarettes: medical device or consumer product? Gornall J. BMJ. 2012 Sep 25;345:e6417. doi: 10.1136/bmj.e6417. No abstract available. Not available online. This was a feature article written by a journalist. Whilst this is commonly quoted as though it was peer reviewed, it did NOT go through the process. It is included here because it is frequently quoted. It summarises the MHRA & ECITA positions and considers the effects of regulation. Patterns of electronic cigarette use and user beliefs about their safety and benefits: an Internet survey. Goniewicz ML, Lingas EO, Hajek P. Drug Alcohol Rev. 2013 Mar;32(2):133-40. doi: 10.1111/j.1465-3362.2012.00512.x. Epub 2012 Sep 20. Abstract only available online. 145 e-cigarette users in Poland were recruited online and asked about usage & beliefs. 66% were no longer smoking conventional cigarettes and 25% were smoking under five cigarettes a day. Most participants (82%) did not think that e-cigarettes were completely safe, but thought that they were less dangerous than conventional cigarettes. Without sight of the full text it is impossible to comment further on this study. Comparison of electronic cigarette refill fluid cytotoxicity using embryonic and adult models. Bahl V, Lin S, Xu N, Davis B, Wang YH, Talbot P. Reprod Toxicol. 2012 Dec;34(4):529-37. doi: 10.1016/j.reprotox.2012.08.001. Abstract only available online. The study assessed e-liquid toxicity on embryonic and adult cells from mice & humans. The abstract does not contain enough detail to comment. Electronic cigarette use among teenagers and young adults in Poland. Goniewicz ML, Zielinska-Danch W. Pediatrics. 2012 Oct;130(4):e879-85. doi: 10.1542/peds.2011-3448. Abstract only available online. The abstract concludes with: “… About one-fifth of Polish youth have tried e-cigarettes; most of them had previously smoked cigarettes. It is unclear whether e-cigarettes are just a novelty that young people try only once or whether they have potential to compete in the marketplace with conventional cigarettes…” The abstract states that ‘cluster sampling’ was used. This method can introduce sampling errors & it is therefore impossible to comment further without sight of the full document. Electronic cigarettes: an evaluation of exposure to chemicals and fine particulate matter (PM). Pellegrino RM, Tinghino B, Mangiaracina G, Marani A, Vitali M, Protano C, Osborn JF, Cattaruzza MS. Ann Ig. 2012 Jul-Aug;24(4):279-88. Abstract only available online. The aim of this study was to assess the content of vapour and the Particulate Matter (PM) emissions of an Italian brand of e-cigarette and to compare with a conventional cigarette. Propylene glycol (66%) and glycerine (24%) were the main components in the liquid, while the flavouring substances were less than 0.1%. The same substances were detected in the vapour in similar proportions. Fine and ultrafine PM emissions were higher for the conventional versus the e-cigarette (e.g. : PM10=922 vs 52 microg/m3; PM1=80 vs 14 microg/m3). It is impossible to comment without sight of the full document. Acute effects of electronic and tobacco cigarette smoking on complete blood count.Flouris AD, Poulianiti KP, Chorti MS, Jamurtas AZ, Kouretas D, Owolabi EO, Tzatzarakis MN, Tsatsakis AM, Koutedakis Y. Food Chem Toxicol. 2012 Oct;50(10):3600-3. doi: 10.1016/j.fct.2012.07.025. FDA summary of adverse events on electronic cigarettes. Chen IL. Nicotine Tob Res. 2013 Feb;15(2):615-6. doi: 10.1093/ntr/nts145. Epub 2012 Aug 1. No abstract available. No abstract or full text is available online. However, the FDA research is well publicised & refutations of it are widely available. e-Cigarette awareness, use, and harm perceptions in US adults. Pearson JL, Richardson A, Niaura RS, Vallone DM, Abrams DB. Am J Public Health. 2012 Sep;102(9):1758-66. doi: 10.2105/AJPH.2011.300526. Only abstract is available online. This ‘survey’ appears to have used pre-existing data from other online surveys and found that awareness of e-cigaretes was ‘high’ . Even viewing the abstract only, it appears to have little value. Abstract only is available online which gives no useful data on this paper and only appears to call for further study. Full text available online. This is an interesting paper . However, the figures (particularly fig. 4) need careful interpretation since the axes between 4a & 4b use different scales & yet are visually presented to make the electronic cigarette look similar to a conventional one . Electronic cigarettes: no such thing as a free lunch…Or puff. Avdalovic MV, Murin S. Chest. 2012 Jun;141(6):1371-2. doi: 10.1378/chest.12-0205. No abstract available. The full text is available online. This is a discussion document which refers mainly to Vardavas et al. (2012) who found short term effects on lung function following electronic cigarette use similar to that caused by traditional cigarettes. Use of emerging tobacco products in the United States. McMillen R, Maduka J, Winickoff J. J Environ Public Health. 2012;2012:989474. doi: 10.1155/2012/989474. Full text is available online. A telephone based survey which claims that more than one in 10 US adults have tried at least one of snus, waterpipe, or ENDS. Whether the survey was robust enough to be representative is debatable & the actual number participating is confusing since the authors state different numbers of participants & response rates. Options for state and local governments to regulate non-cigarette tobacco products.Freiberg M. Ann Health Law. 2012 Winter;21(2):407-45, 5 p preceding i.
Abtract only available. The paper considers gaps in US regulation using five products as case studies: dissolvable tobacco products, electronic cigarettes, little cigars, snus, and water pipes from an anti-smoking perspective. The article presents policy options that state and local governments can adopt to regulate: price, flavour, youth access, use in public places, point-of-sale warnings, and marketing. The electronic cigarette: what proportion of smokers have tried it and how many use it regularly? Kralikova E, Kubatova S, Truneckova K, Kmetova A, Hajek P. Addiction. 2012 Aug;107(8):1528-9. doi: 10.1111/j.1360-0443.2012.03916.x. Full text available. Letter to the editor of ‘Addiction’ reporting on a structured interview survey of smokers (n=973) conducted in Prague during late 2011. The authors admit that the study has limitations but it showed that, in their sample, about a quarter who had tried an e-cig progressed to regular use. Commentary on Wagener et al. (2012): electronic cigarettes – the Holy Grail of nicotine replacement? Full text available online. The author discusses the need for some regulation but cautions against heavy legal regulation. Successful smoking cessation with electronic cigarettes in smokers with a documented history of recurring relapses: a case series. Caponnetto P, Polosa R, Russo C, Leotta C, Campagna D. J Med Case Rep. 2011 Dec 20;5(1):585. doi: 10.1186/1752-1947-5-585. Full text available online. The paper gives case studies of three smokers, with a documented history of recurring relapses who were able to quit smoking and to remain abstinent for at least six months after taking up an electronic cigarette. However, it also provides a useful critique of the FDA study. Public health challenges of electronic cigarettes in South Korea. Lee S, Kimm H, Yun JE, Jee SH. J Prev Med Public Health. 2011 Nov;44(6):235-41. doi: 10.3961/jpmph.2011.44.6.235. Full text available online. In principle the paper calls for a ban on e-cigs until they are proven to be safe. The authors use a variety of studies (including the FDA) in an attempt to justify their view. Mining data on usage of electronic nicotine delivery systems (ENDS) from YouTube videos. Hua M, Yip H, Talbot P. Tob Control. 2013 Mar;22(2):103-6. doi: 10.1136/tobaccocontrol-2011-050226. Epub 2011 Nov 24. Abstract only available online. This paper concludes that ENDS puff duration should be considered when designing laboratory and clinical trials. However, You Tube videos could hardly be considered a valid data source. Without sight of the full text it is impossible to comment further on this study. Saliva cotinine levels in users of electronic cigarettes. Etter JF, Bullen C. Eur Respir J. 2011 Nov;38(5):1219-20. doi: 10.1183/09031936.00066011. Electronic nicotine delivery systems: adult use and awareness of the ‘e-cigarette’ in the USA. Regan AK, Promoff G, Dube SR, Arrazola R. Tob Control. 2013 Jan;22(1):19-23. doi: 10.1136/tobaccocontrol-2011-050044. Abstract only available online. There is little information on the sample given in the abstract. The study claims that there was a doubling of awareness in the US between 2009 & 2010 and a quadrupling of use of e-cigs. It is impossible to comment further without sight of the full document. Electronic-cigarette smoking experience among adolescents. Cho JH, Shin E, Moon SS. J Adolesc Health. 2011 Nov;49(5):542-6. doi: 10.1016/j.jadohealth.2011.08.001. Abstract only available online. Using data from an earlier (2008) Korean study of 5 schools, the authors completed a further statistical analysis to try to determine the ‘predictors of e-cigarette experience’ . It is impossible to comment further without sight of the full document. Variability among electronic cigarettes in the pressure drop, airflow rate, and aerosol production. Williams M, Talbot P. Nicotine Tob Res. 2011 Dec;13(12):1276-83. doi: 10.1093/ntr/ntr164. Abstract only available online. This appears to have been a very small smoking machine study which claims to have found variability between and within e-cig brands in airflow rate required to produce aerosol, pressure drop, length of time cartridges lasted and production of aerosol. It is impossible to comment further without sight of the full document. Effect of an electronic nicotine delivery device (e-Cigarette) on smoking reduction and cessation: a prospective 6-month pilot study. Polosa R, Caponnetto P, Morjaria JB, Papale G, Campagna D, Russo C. BMC Public Health. 2011 Oct 11;11:786. doi: 10.1186/1471-2458-11-786. Full text available online. This was a small pilot study (n=40) & must therefore be treated with caution. However, it found that e-cigs substantially decreased cigarette consumption without causing significant side effects in smokers not intending to quit. Commentary on Etter &amp; Bullen (2011): could E-cigs become the ultimate nicotine maintenance device? Foulds J, Veldheer S. Addiction. 2011 Nov;106(11):2029-30. doi: 10.1111/j.1360-0443.2011.03532.x. No abstract available. Full text available online. Argues that e-cigs could become a useful alternative to tobacco. Electronic cigarettes as a method of tobacco control. Borland R. BMJ. 2011 Sep 30;343:d6269. doi: 10.1136/bmj.d6269. Abstract only available online (at BMJ.com). The article is an editorial piece which argues that physicians should first offer traditional NRT. Where smokers are unable or unwilling to use or continue to use other NRT, and who are interested in e-cigarettes, G.P.’s should suggest that these are a better option than continuing to smoke. 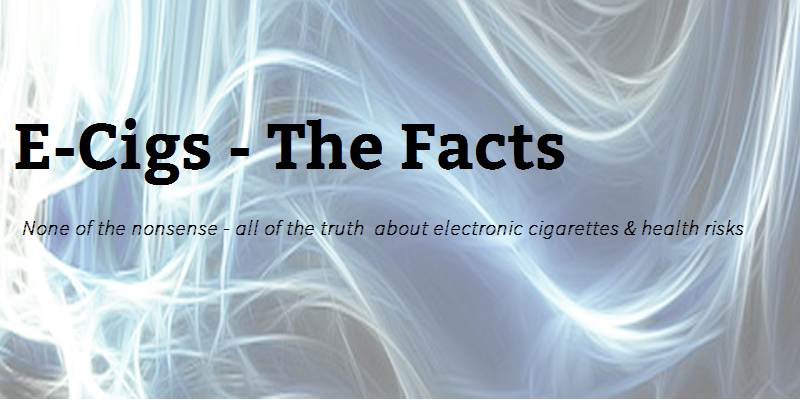 Electronic cigarettes (e-cigs): views of aficionados and clinical/public health perspectives. Foulds J, Veldheer S, Berg A. Int J Clin Pract. 2011 Oct;65(10):1037-42. doi: 10.1111/j.1742-1241.2011.02751.x. Full text available online. The study interviewed 104 experienced e-cig users and provides an analysis of the data but argues that complete abstinence, or traditional methods are preferable to the e-cig, principally because of lack of evidence. It concedes that e-cigs are preferable to smoking tobacco. Electronic cigarette: users profile, utilization, satisfaction and perceived efficacy.Etter JF, Bullen C. Addiction. 2011 Nov;106(11):2017-28. doi: 10.1111/j.1360-0443.2011.03505.x. Abstract only available online. The study was an online survey in English & French languages. The main findings from 3587 participants (70% former tobacco smokers, 61% men, mean age 41 years). were that 96% said the e-cig helped them to quit smoking & 92% to reduce their smoking . Reasons for using the e-cigarette included the perception that it was less toxic than tobacco (84%), to deal with craving for tobacco (79%) and withdrawal symptoms (67%), to quit smoking or avoid relapsing (77%), because it was cheaper than smoking (57%) and to deal with situations where smoking was prohibited (39%). Most ex-smokers (79%) feared they might relapse to smoking if they stopped using the e-cigarette. Without sight of the full text it is impossible to comment further on this study. Nicotine levels in electronic cigarettes. Goniewicz ML, Kuma T, Gawron M, Knysak J, Kosmider L. Nicotine Tob Res. 2013 Jan;15(1):158-66. doi: 10.1093/ntr/nts103. Abstract only available online. Sixteen e-cigs were tested for nicotine levels using a modified smoking machine and gas chromatography. The study found that brands and models differ in their efficacy and consistency of nicotine vaporization. In those which vaporised nicotine effectively, the amount inhaled from 15 puffs was lower compared with smoking a conventional cigarette. Without sight of the full text it is impossible to comment further on this study. The electronic-cigarette: effects on desire to smoke, withdrawal symptoms and cognition. Dawkins L, Turner J, Hasna S, Soar K. Addict Behav. 2012 Aug;37(8):970-3. doi: 10.1016/j.addbeh.2012.03.004. Abstract only available online. 86 smokers were randomly allocated to one of three groups – 0mg nic e-cig, 18mg e-cig and a group just allowed to hold an e-cig. In the first two groups, desire to smoke and withdrawal symptoms were alleviated when tested 20 min after use. The nicotine e-cigarette was found to enhance working memory performance on a psychological test. Without sight of the full text it is impossible to comment further on this study. Electronic cigarettes: achieving a balanced perspective. Wagener TL, Siegel M, Borrelli B. Addiction. 2012 Sep;107(9):1545-8. doi: 10.1111/j.1360-0443.2012.03826.x. Abstract only available online. The paper argues that the main objections to e-cigs are largely spurious. It is impossible to comment further without sight of the full document. Dependence on tobacco and nicotine products: a case for product-specific assessment. Fagerström K, Eissenberg T. Nicotine Tob Res. 2012 Nov;14(11):1382-90. doi: 10.1093/ntr/nts007. Abstract only available online. Argues that product-specific questionnaires may be required to assess the dependence on e-cigs & other NCP’s. It is impossible to comment further without sight of the full document. Electronic cigarettes: new kit on the rack. Leelavathi M, Das S. Int J Clin Pract. 2012 Apr;66(4):417; author reply 417-8. doi: 10.1111/j.1742-1241.2011.02866.x. No information is available on this paper online without subscription. Nicotine control: E-cigarettes, smoking and addiction. Bell K, Keane H. Int J Drug Policy. 2012 May;23(3):242-7. doi: 10.1016/j.drugpo.2012.01.006. Abstract only available online. The paper argues that e-cigarettes highlight the complex status of nicotine as both a poison and remedy in contemporary public health and tobacco control. It concludes that: ‘… e-cigarettes jeopardize the carefully drawn distinctions between ‘good’ and ‘bad’ forms of nicotine…’ It is impossible to comment further without sight of the full document. Non-cigarette tobacco products: what have we learnt and where are we headed?O’Connor RJ. Tob Control. 2012 Mar;21(2):181-90. doi: 10.1136/tobaccocontrol-2011-050281. Full text is available online. Discussion paper which argues that tobacco control should shift their focus from tobacco to non-cigarette tobacco products but the paper seems to consider e-cigs as a tobacco product rather than a NCP. The paper argues that flavours might be controlled under the FCTC and whilst it provides a suggested research agenda, it appears to be against anything derived from or having links with tobacco. Electronic cigarettes: effective nicotine delivery after acute administration. Vansickel AR, Eissenberg T. Nicotine Tob Res. 2013 Jan;15(1):267-70. doi: 10.1093/ntr/ntr316. Abstract only available. The study measured plasma nicotine concentration, heart rate, and opinion ratings of nicotine/product effects and abstinence symptoms over 5 hours on 8 experienced e-cig users and found that user experience and/or device characteristics likely influence e-cig nicotine delivery and other effects. It is impossible to comment further without sight of the full document. E-cigarettes: promise or peril? Riker CA, Lee K, Darville A, Hahn EJ. Nurs Clin North Am. 2012 Mar;47(1):159-71. doi: 10.1016/j.cnur.2011.10.002. Erratum in: Nurs Clin North Am. 2012 Jun;47(2):315. Abstract only available on line. Appears to provide an overview of the history, production, and marketing of e-cigarettes, the contents of e-cigarettes and vapour, how they are used, public health concerns, and implications for nursing practice, research, and policy development. It is impossible to comment further without sight of the full document. The emerging phenomenon of electronic cigarettes. Caponnetto P, Campagna D, Papale G, Russo C, Polosa R. Expert Rev Respir Med. 2012 Feb;6(1):63-74. doi: 10.1586/ers.11.92. Review. Abstract only available online. Appears to be a discussion document covering the health effects of using electronic cigarettes, with consideration given to the acceptability, safety and effectiveness. Without sight of the full text it is impossible to comment further on this study. Clinical laboratory assessment of the abuse liability of an electronic cigarette.Vansickel AR, Weaver MF, Eissenberg T. Addiction. 2012 Aug;107(8):1493-500. doi: 10.1111/j.1360-0443.2012.03791.x. Abstract only available online. The abstract concludes: “… Electronic cigarettes can deliver clinically significant amounts of nicotine and reduce cigarette abstinence symptoms and appear to have lower potential for abuse relative to traditional tobacco cigarettes, at least under certain laboratory conditions…” It is impossible to comment further without sight of the full document. Full text available online. The study found that 5 minutes of e-cig use had a negative impact on lung function. Whilst the results were statistically significant, the clinical changes may be too small to be of major clinical importance. However, the work does highlight an area further of longer-term research. Interviews with “vapers”: implications for future research with electronic cigarettes.McQueen A, Tower S, Sumner W. Nicotine Tob Res. 2011 Sep;13(9):860-7. doi: 10.1093/ntr/ntr088. Abstract only available online. The study consisted of qualitative interviews with a group of 15 vapers . The paper highlights the learning curve involved with e-cigs which has implications for any laboratory tests with novice users. It is impossible to comment further without sight of the full document. Electronic cigarettes and thirdhand tobacco smoke: two emerging health care challenges for the primary care provider. Kuschner WG, Reddy S, Mehrotra N, Paintal HS. Int J Gen Med. 2011 Feb 1;4:115-20. doi: 10.2147/IJGM.S16908. Full text is available online. This paper was written to inform American primary care providers on a number of issues related to smoking. It concludes that until more information about ENDS becomes available, use of e-cigarettes cannot be recommended. Electronic nicotine delivery systems: a research agenda. Etter JF, Bullen C, Flouris AD, Laugesen M, Eissenberg T. Tob Control. 2011 May;20(3):243-8. doi: 10.1136/tc.2010.042168. Full text available online. The papers aim was to identify priorities for non-clinical, clinical and public health research on e-cigs. The priority it argues for is that of creating a safety profile for e-cigs. Electronic cigarettes as a smoking-cessation: tool results from an online survey.Siegel MB, Tanwar KL, Wood KS. Am J Prev Med. 2011 Apr;40(4):472-5. doi: 10.1016/j.amepre.2010.12.006. Full text available online. Followed (for six months) a group of 216 smokers who had purchased a ‘Blu’ e-cigarette during the same two week period. The key findings were that smoking abstinence among the e-cigarette users in the sample was 31.0% (95% CI=24.8%, 37.2%). A large percentage of respondents reported a reduction in the number of cigarettes they smoked (66.8%) and almost half reported abstinence from smoking for a period of time (48.8%). Those respondents using e-cigarettes more than 20 times per day had a quit rate of 70.0%. Of respondents who were not smoking at 6 months, 34.3% were not using e-cigarettes or any nicotine-containing products at the time. Tracking the rise in popularity of electronic nicotine delivery systems (electronic cigarettes) using search query surveillance. Ayers JW, Ribisl KM, Brownstein JS. Am J Prev Med. 2011 Apr;40(4):448-53. doi: 10.1016/j.amepre.2010.12.007. Full text available online. The study examined English-language Google searches conducted from January 2008 through September 2010. These were compared to snus, nicotine replacement therapy (NRT), and Chantix® or Champix®. The graphs show a considerable rise in search activity. Electronic cigarettes as a harm reduction strategy for tobacco control: a step forward or a repeat of past mistakes? Cahn Z, Siegel M. J Public Health Policy. 2011 Feb;32(1):16-31. doi: 10.1057/jphp.2010.41. Full text available online. The paper provides background information & a review of the evidence on e-cig and concludes that they show tremendous promise in the fight against tobacco-related morbidity and mortality. E-cigarettes: a rapidly growing Internet phenomenon. Yamin CK, Bitton A, Bates DW. Ann Intern Med. 2010 Nov 2;153(9):607-9. doi: 10.1059/0003-4819-153-9-201011020-00011. Abstract only available online. It concludes that: “…Physicians should be aware of the popularity, questionable efficacy claims, and safety concerns of e-cigarettes so that they may counsel patients against use…” It is impossible to comment further without sight of the full document. Electronic cigarettes: a new ‘tobacco’ industry? Noel JK, Rees VW, Connolly GN. Tob Control. 2011 Jan;20(1):81. doi: 10.1136/tc.2010.038562. A clinical laboratory model for evaluating the acute effects of electronic “cigarettes”: nicotine delivery profile and cardiovascular and subjective effects. Vansickel AR, Cobb CO, Weaver MF, Eissenberg TE. Cancer Epidemiol Biomarkers Prev. 2010 Aug;19(8):1945-53. doi: 10.1158/1055-9965.EPI-10-0288. Full text available online. The study took 32 smokers & split then into four groups. One group used their own brand cigarette, 2 groups each used different e-cigs and the final group used an unlit cigarette. Plasma nicotine and carbon monoxide (CO) concentration, heart rate, and subjective effects were assessed. The study found that Own brand significantly increased plasma nicotine and CO concentration and heart rate within the first five minutes of administration whereas the e-cigs and sham smoking did not. Own brand, e-cigs (but not sham) significantly decreased tobacco abstinence symptom ratings and increased product acceptability ratings. The magnitude of symptom suppression and increased acceptability was greater for own brand than for e-cigs. The study falls down in that the participants were naïve, although it may have implications for first time users. Conventional and electronic cigarettes (e-cigarettes) have different smoking characteristics. Trtchounian A, Williams M, Talbot P. Nicotine Tob Res. 2010 Sep;12(9):905-12. doi: 10.1093/ntr/ntq114. Abstract only available online. The smoking properties of conventional and e-cigarettes were compared by examining the vacuum required to produce smoke or aerosol and the density of the smoke/aerosol over time was also considered. The conclusion reached was that e-cigs required stronger vacuums than conventional brands. However, it is not clear from the abstract what number and which brands of e-cig were used. Therefore, it is impossible to comment further without sight of the full document. Electronic cigarettes: a survey of users. Etter JF. BMC Public Health. 2010 May 4;10:231. doi: 10.1186/1471-2458-10-231. Full text available online. The study was a small (n=81) internet based survey conducted in 2009. The results suggest that e-cigs are used mainly to quit smoking. Effect of an electronic nicotine delivery device (e cigarette) on desire to smoke and withdrawal, user preferences and nicotine delivery: randomised cross-over trial.Bullen C, McRobbie H, Thornley S, Glover M, Lin R, Laugesen M. Tob Control. 2010 Apr;19(2):98-103. doi: 10.1136/tc.2009.031567. Abstract only available online. The study consisted of 40 adult dependent smokers who were randomised to use e-cigs containing 16 mg nicotine or 0 mg capsules, Nicorette nicotine inhalator or their usual cigarette on each of four study days 3 days apart, with overnight smoking abstinence before use of each product. The study concluded that: “… The 16 mg Ruyan V8 ENDD alleviated desire to smoke after overnight abstinence, was well tolerated and had a pharmacokinetic profile more like the Nicorette inhalator than a tobacco cigarette. Evaluation of the ENDD for longer-term safety, potential for long-term use and efficacy as a cessation aid is needed…” It is impossible to comment further without sight of the full document. Nicotine electronic cigarette sales are permitted under the Smokefree Environments Act. Laugesen M. N Z Med J. 2010 Jan 23;123(1308):103-5. Electronic cigarettes: miracle or menace? Flouris AD, Oikonomou DN. BMJ. 2010 Jan 19;340:c311. doi: 10.1136/bmj.c311. No information is available online without subscription. However this was an opinion piece in the BMJ which discussed the reports from the FDA, HNZ, and Demokritos. The author concluded that these reports cannot be used to draw any conclusions and called for more rigorous independent analyses but in the mean time suggested that healthcare professionals should inform consumers that safety claims of manufacturers may be fallacious. Pharmacologic agents for smoking cessation: a clinical review. Patel DR, Feucht C, Reid L, Patel ND. Clin Pharmacol. 2010;2:17-29. doi: 10.2147/CPAA.S8788. Abstract only available online. WHO recommends a ban on disseminating information that suggest that electronic nicotine vaporisers are safer than cigarettes, or that they are an effective way of combating nicotine addition, until appropriate evidence can be provided. According to the WHO recommendations, references to efficacy of electronic vaporisers for quitting smoking or to their health effects must be backed by reliable pharmacokinetics studies, safety and efficacy tests and appropriate certification from regulatory bodies. This study reports on the WHO paper. Debunking the claim that abstinence is usually healthier for smokers than switching to a low-risk alternative, and other observations about anti-tobacco-harm-reduction arguments. Phillips CV. Harm Reduct J. 2009 Nov 3;6:29. doi: 10.1186/1477-7517-6-29. Electronic cigarettes: safety concerns and regulatory issues. Wollscheid KA, Kremzner ME. Am J Health Syst Pharm. 2009 Oct 1;66(19):1740-2. doi: 10.2146/ajhp090127. No abstract available. Erratum in: Am J Health Syst Pharm. 2009 Nov 1;66(21):1900. FDA: Electronic cigarettes may be risky. Kuehn BM. JAMA. 2009 Sep 2;302(9):937. doi: 10.1001/jama.2009.1245. No abstract available. Full text available online. This is a brief journal article summarising the FDA announcements & follow-up workshop. Opinions about smoking bans and e-cigarettes among inhabitants of Poznan–the results of a pilot study. Szmagaj A, Jóźwiak P. Przegl Lek. 2009;66(10):805-8. Polish. Abstract only available online. It states that: “… The aim of the pilot study was to assess the opinions about smoking bans and e-cigarettes among inhabitants of Poznan. In this research we used inquiry-sheet public opinion tool verifying acquaintance of problem. Opinions in that survey were different among men and women. Most women declared support for smoke-free policies. The highest level of support was for smoke-free public transport. Majority of respondents believed that polish smokers do not respect smoke-free regulations. E-cigarettes have not a big chance to be popular in Poland…” Without sight of the full text it is impossible to comment further on this study. Tobacco-free electronic cigarettes and cigars deliver nicotine and generate concern.Pauly J, Li Q, Barry MB. Tob Control. 2007 Oct;16(5):357. No abstract available. Full text available online. This article announced the introduction of the Ruyan cigarette & raised questions about its safety. Full text available online. In smokers not intending to quit, the use of e-cigarettes, with or without nicotine, decreased cigarette consumption and elicited enduring tobacco abstinence without causing significant side effects. This list was compiled from pubmed & BMJ searches for peer reviewed documents from 2007 to June 2013. • Dawkins L. (2013) Electronic cigarettes: what are they and are they effective? E-Cigarette Summit, London, UK: (oral presentation). Available at: http://e-cigarette-summit.com/wp-content/uploads/2013/12/Summit-Presentations.pdf [accessed 22 December 2013]. •Farsalinos K., Tsiapras D., Kyrzopoulos S., Stefopoulos C., Spyrou A., Tsakalou M., et al. (2013f) Immediate effects of electronic cigarette use on coronary circulation and blood carboxyhemoglobin levels: comparison with cigarette smoking. Eur Heart J 34(Abstract Supplement): 13. •Laugesen M. (2008) Safety Report on the Ruyan® e-cigarette Cartridge and Inhaled Aerosol. Available at: http://www.healthnz.co.nz/RuyanCartridgeReport30-Oct-08.pdf (Accessed: 18 November 2013). •Laugesen M. (2009). Ruyan®E-cigarette Bench-top tests. Society for Research on Nicotine and Tobacco (SRNT) Dublin, Poster 5-11. Available at: http://www.healthnz.co.nz/DublinEcigBenchtopHandout.pdf [accessed 20 November 2013]. •MHRA Commission on human medicines, Working Group on nicotine containing products (NCPS) (2013). Current use of electronic cigarettes. Available at: http://www.mhra.gov.uk/home/groups/comms-ic/documents/websiteresources/con286845.pdf (Accessed: 20 November 2013). •Palamidas A., Gennimata S., Kaltsakas G., Tsikrika S., Vakali S., Gratziou C., et al. (2013) Acute effect of an e-cigarette with and without nicotine on lung function. Presented at the European Respiratory Society’s Annual Congress, Poster P1054 Available at: http://www.ersnet.org/learning_resources_player/abstract_print_13/files/100.pdf (Accessed: 20 November 2013). •Romagna G., Zabarini L., Barbiero L., Bocchietto E., Todeschi S., Caravati E., et al. (2012) Characterization of chemicals released to the environment by electronic cigarettes use (ClearStream-Air project): is passive vaping a reality? SRNT Europe Annual Congress, Helsinki, Finland Poster RRP18. Available at: http://www.srnteurope.org/assets/srnt-e2012abstractbook.pdf [accessed 20 November 2013]. •A critique of a WHO-commissioned report and associated article on electronic cigarettes. •Asking the wrong questions about e-cigarettes? A response to Stan Shatenstein. •Commentary in response to the letter from Farsalinos et al. regarding our publication entitled: “Identification of toxicants in cinnamon-flavored electronic cigarette refill fluids”. •Is there any legal and scientific basis for classifying electronic cigarettes as medications? •E-cigarette use and indoor air quality: methodological limitations: response to Schober et al. “use of electronic cigarettes (e-cigarettes) impairs indoor air quality and increases FeNO levels of e-cigarette consumers”. •It is preferable for surgical patients to use e-cigarettes rather than smoke cigarettes.